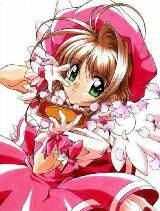 You are going to Watch Cardcaptor Sakura Episode 15 English dubbed online free episodes with HQ / high quality. Stream Anime Cardcaptor Sakura Episode 15 Online English dub Sakura and Kero’s Big Fight, Syaoran captures his second Clow Card after defeating the Storm card. Tension develops between Kero and Sakura over the Syaoran issue which builds into a fight the next day after Kero makes a mess after building a room inside Sakura’s desk drawer. While Sakura is at school, Kero eats liquor filled chocolate and wanders out the window drunk. The next day, he finds himself with a young girl named Akane who lives alone with her mother. Unable to escape, Kero secretly contacts the worried Sakura by fax. Akane wishes she could fly to see her father in heaven and the Float card makes her dreams come true. Sakura comes to her rescue and brings Kero back home. As a way of making amends, Sakura redesigns her bottom desk drawer to become Cerberus’s bedroom from now on.